TRV's (Thermostatic Radiator Valve) are used to control the volume of water that flows in to your radiator. 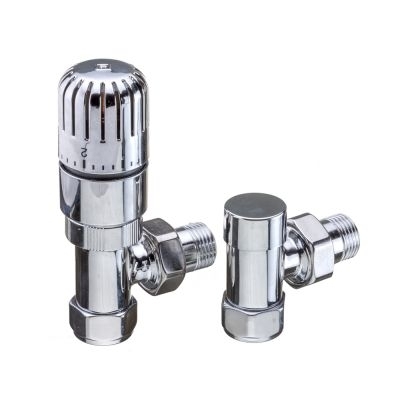 It is a more advanced valve than a manual radiator valve with the main difference being a TRV is able to self regulate, they take into consideration the temperature in the room and makes sure the radiator then works toward the maximum room temperature, saving you money on your bills at the same time. Image shows angled chrome valve.